could get him home to the farm. Despite being so young he didn’t know how to eat food yet, he persevered and grew into a 100-pound dog (with much care from Mother and Daddy). Although I was away most of the time at school, he seemed to never forget that I was the one who rescued him, and he was devoted to me. That devotion was tested to the extreme when I tried to get a tan during the summer break. Tanning was a bad idea from the word go. I had dark hair, but was very pale and had light hazel eyes, sure signs of a skin cancer magnet. However, nobody knew about those things back in the day, and every teenage girl had to have a tan. I would “lay out” on a collapsible chaise lounge on the concrete walkway in front of our house on a hot day, covering myself in SPF8 Coppertone (the highest strength then!) and shaking water on from Mother’s sprinkle bottle to cool off. Chico was determined to be as close to me as possible, so he would lie in the sun next to my chair, panting. This made him miserable, so his next move was to get underneath the chair in the small patch of shade. That made me miserable, having a big, hot dog sweating under the chair, so I made him move. He retreated to the shade at the side of the house, panting until he cooled down some. Then the cycle repeated until we were both too hot to bear it, and I went in the air-conditioned house. 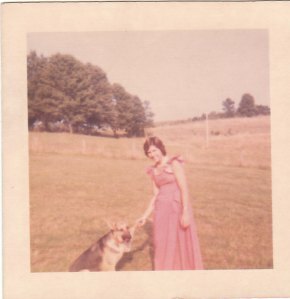 To this day, when I hear the drone of cidadas (dry flies, we called them) and the hum of unit air conditioners, I’m carried back to the young, skinny me, resolutely turning pink in pursuit of fashion, and that oversized, black-and-tan German shepherd panting in the sun. All he ever got out of it besides my company was Nehi Orange, which he learned to drink from the bottle.